If you are the type of parents/guardians who are not satisfied with safety gates that only enclose one specific location, then the Regalo 192 inch Super Wide Gate and Play Yard is just what you need for your house. This safety gate expands up to 192 inches, and can enclose a larger area than a doorway, the top of the stairs or the kitchen entrance. For a bigger home that has a lot of spaces where you don’t want your child to go into, the Regalo Super Wide Gate is the perfect choice. It works as a safety gate as well as a play yard that can be set up inside or outside the house. The most unique feature of this safety gate is the way that it expands to 192 inches, enclosing more space out of reach of your child, especially if you have a larger house. 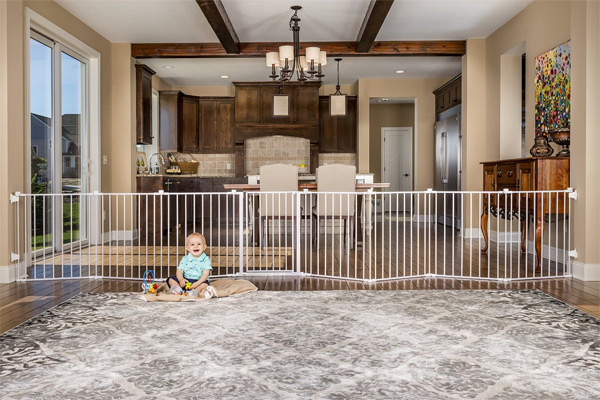 The gate can also be set up as a play yard if you want your child to have a large play pen to play inside – whether it is inside or outside the house. As a gate, you can put up the Regalo Super Wide not only at the top of the stairs and in the middle of hallways, but also around the fireplace, any furniture that you consider dangerous, or even an entire portion of the house. As a play yard, the Regalo Super Wide is also extremely compact and can be set up anywhere inside or outside the home, ensuring a spacious play zone for your child to stay inside. 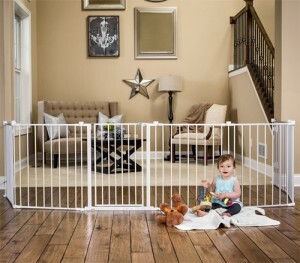 This safety gate is 192 inches in length and 28 inches in height; as a play pen, it creates an enclosure that is 19 square feet in space and quite big enough for your child to sit, stand, sleep and crawl inside. 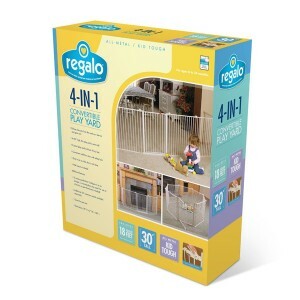 The Regalo Super Wide gate is certified safe by the American Society for Testing Materials (ASTM) and is PVC free. There is no other safety gate that is as better as this one when it comes to a big house or a versatile product that can be used in more ways than one. The whole gate is comprised of 8 individual barriers that together make up 192 inches in length. If you want to use the same gate in a relatively smaller space temporarily, it is possible to do so with only 6 or 4 of the barriers, instead of 8. The individual barriers are lightweight and easy to store conveniently, as well as to travel with. There have been some cases of this gate breaking down unexpectedly due to the lightweight plastic material which is attractive but not very sturdy. Also, being a very light material, it may be possible for some active older children to topple down one of the sides of the gate when used as a playpen. Besides, the built-in gate has a childproof lock that is easy for the adults, but at the same time, not so difficult for toddlers and older children to figure out.